There are lots of luxury hotels in Italy, many of which blend in with the country’s amazing countryside, wonderful old towns, and all round panoramas. Plenty of luxury hotels are placed in touristy places, such as Milan, Rome , Florence and Venice, while more are found everywhere, from the snowy Alps, to the serene country, beaches, islands, to smaller towns. Italy has many different faces and lots of luxury hotels from which to enjoy them. From the stylish sophisticated fashion houses of Milan and the historic treasures of Venice and Rome to the rolling hills of Tuscany, you will find to suit each and every visitor. Add outstanding food and first class wine and cheese and you are in for a gastronomic treat too! Booking a hotel in Italy is easy. No fees, pay in the hotel. 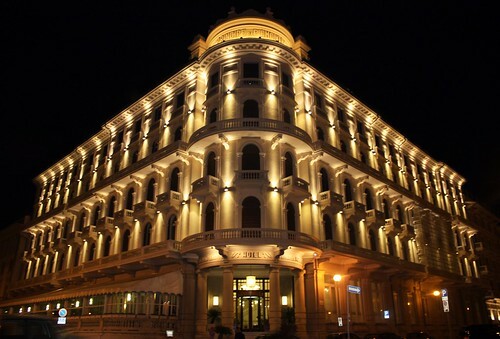 Grand Hotel Savoia is 500 metres from Piazza Principe Railway Station. Rooms feature free Wi-Fi access, free mineral water, and an LCD TV with Sky channels. The Savoia is one of Genoa’s few 5-star hotels offering a gym and a wellness centre with sauna, swimming pool, and aromatherapy showers. You will also find 2 jacuzzi baths on the panoramic terrace. You can enjoy great food and beautiful views at the Novecento Restaurant. There is also a cocktail bar and executive lounge. Grand Hotel Savoia’s private garden includes a unique children’s playground. Opened in September 2009, Boscolo Exedra gives you utmost comfort in the heart of one of the worlds leading fashion capitals, complete with a luxury spa and elegant restaurant. A unique, futuristic design sets this hotel apart from the rest. Large windows make every common area bright and attractive. The hall, reception, and restaurant are all united in 1 open-plan area. The sophisticated lounge bar is perfect for a refreshing cocktail or light meal. The guest rooms at Boscolo Exedra Milano come with all the latest amenities, including LCD TVs and design furniture. Relax in the spa where you will find a heated swimming pool, a sauna, and Turkish bath. The hotel has a total of 4 modern conference rooms that can accommodate up to 170 delegates. The Carlton Hotel Baglioni is located in the heart of Milan’s exclusive fashion quarter. This luxurious hotel adds a touch of class to your stay in Italy’s most fashionable city. Set on the renowned Via della Spiga this elegant boutique hotel is an ideal location for a business engagement with a variety of spacious meeting rooms available. An English style library complete with traditional furnishings is an excellent choice for smaller meetings. The hotel’s Caffè Baglioni is an extremely popular meeting point with the Milan business crowd as is the established Baretto al Baglioni Restaurant. The hotel also features the Guerlain Spa offering a selection of superior well being and beauty treatments. With its unique island setting, the San Clemente Palace provides an excellent choice of free facilities, including a golf course, wellness centre, and boat transfer to Saint Mark’s Square. Rooms at this 5-star hotel feature air conditioning, satellite TV, and Wi-Fi access. You will be on San Clemente Island, just 12 minutes from Venice’s historic centre by boat. San Clemente Palace Hotel & Resort boasts an outdoor swimming pool, plus a wellness centre with sauna, jacuzzi, gym, and much more. The Metropole is one of the most luxurious hotels in Venice and offers views of the Lagoon from a privileged position, just a short stroll from Saint Mark’s Square. Hotel Metropole is like a small museum. Inside you can admire a collection of rare visiting-card cases, antique fans and art objects. You will be impressed by the list of past and present celebrities who stayed at the Metropole. All rooms of Hotel Metropole feature period furnishings and fascinating collectors’ items. The Met Restaurant is the only Michelin-starred hotel restaurant in Venice. Enjoy gourmet cuisine in a refined ambiance. Abitalia is near the San Rossore Natural Reserve and offers amazing views of the Leaning Tower of Pisa. Five-star facilities include outdoor pool and roof garden with lounge. Rooms and suites at Abitalia Tower Plaza overlook the Leaning Tower or the pool, and come with free Wi-Fi and free Sky channels. Services include a restaurant and a wellness area with Turkish bath, emotional shower, and fitness facilities. Overlooking the Baroque church of Campo San Moisè and just 2 minutes from St. Mark’s Square, Bauer Hotel is a famous, contemporary styled establishment, featuring the true atmosphere of Venice. Offering its guests warm hospitality, impeccable service and a genteel atmosphere, the Bauer Hotel has been a Venice favourite of artists and royalty for generations. The 91 luxurious guest rooms and 18 suites have been renovated in modern meets classic style, featuring state of the art facilities perfectly blended into an old-world atmosphere. Some of the rooms and suites are located in the Casa Nova, a 16th-century building next to Campo San Moisè. The hotel’s gourmet restaurant, De Pisis, with its terrace overlooking the Grand Canal, is much more than a hotel restaurant: it is a destination for people of discerning taste and palate. The dining room, decorated in Venetian style, recreates the charming and intimate atmosphere of past times, surrounded by a pleasant air of kindness and competence. In such an exclusive setting, Chef Giovanni Ciresa offers an original cuisine based on international cooking and enriched by local Mediterranean traditions. This 5-star seasonal resort offers luxurious design, spacious accommodation, a beautiful private beach and a relaxing atmosphere on the Venice Lido. Open from 1 April until 31 October, Hotel Excelsior Venice offers views of the beach. Relax in the elegantly designed lobby. Admire crystal chandeliers and bright interiors. Friendly hotel staff will assist you with getting around Venice. You will be near public water transport and water taxis. Piazza San Marco is just a short boat ride from this peaceful resort. 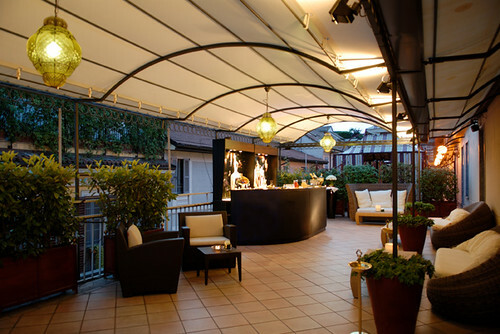 Set on the Lido, Hotel Excelsior is near the Venice Film Festival. Hotel Excelsior Venice offers a wide variety of sport facilities. Relax by the pool, play tennis, and go sailing or water skiing. Stay in large rooms or junior suites at Hotel Excelsior. 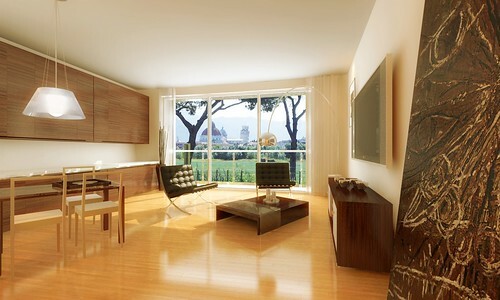 Some rooms offer panoramic balconies and views of the sea or the magical city of Venice. Recommended in Condé Nast Traveler’s Gold list since 2005, this grand hotel offers a variety of dining facilities. Start your day with the hotel’s rich buffet breakfast. AC Torino is a 5-minute drive from the Fiat factory and Lingotto Fiere convention centre, in Turin’s main business district. Its rooms offer a free minibar and free gym access. This hotel combines modern facilities with traditional architecture as it is set in an old pasta factory, which dates back to 1908. Your room at the Torino AC hotel is air conditioned and features a plasma-screen TV, 4 pillows, and special reading lights at the head of the bed. AC Torino offers a gym with jacuzzi and Turkish bath, plus a terrace and private garden. I Cavalieri restaurant serves Mediterranean food. Located in front of the sea, Grand Hotel Principe Di Piemonte offers all the ingredients of a perfect stay: great location, comfortable rooms and entertaining facilities. The Principe Di Piemonte is comprised of classic rooms and deluxe suites, located on 5 floors, decorated in different styles. Relax in the hotel’s wellness centre, enjoy the outdoor swimming pool with hydromassage and a breathtaking panorama of the coast and the Apuane Alps. Italy is filled with superb points of interest of all kinds, from beautiful areas and wonderful buildings and structures, to cutting-edge culture, to stunning pure beauty all-round. There are numerous locations all over Italy that might be worth a visit, although there is certainly a little of everything – the intriguing towns, culture and vistas – in virtually every major city and touristy regions. Italy is a great location for holiday destination that provides the best luxury hotels overlooking the sea, islands, or mountains. Numerous wealthy families enjoy water sports as well as other summer play ground activities that make it an ideal beach for a vacation journey in Europe. Luxury travel and resorts have got a great atmosphere and give peaceful beaches making your vacation trip more enjoyable and remarkable. You can also enjoy the charms of Italy luxury resorts and hotels if you hire the services of a reputable online holiday booking source. Luxury resorts and hotels in Italy offer people the luxurious opulence that they demand. Italy, having a delicious food, piazzas, monuments, church buildings, museums and galleries and wine regions, will certainly set any traveler's heart afire. Rome is considered the capital city of Italy and thus Rome hotels surpass hotels in almost any other Italian place. Primary points of interest to discover in Rome are The Colosseum, Vatican museums, The Pantheon, Tabularium, and much more.